My Appointment | Pierneef Med | Book appointments online hassle free. Since opening our doors in 2010 we at Pierneef-Med has grown into a family of unique healthcare providers. Our main focus has always been to provide the best possible care and service to the community in which we work and live. Pierneef-Med is able to attend to the health needs of the community by providing a team of qualified doctors, with special interests ranging from paediatrics, dermatology and gynaecology as well as family medicine. We believe that it is our job to help you recover, should you become ill, but more importantly to assist you in maintaining a healthy way of life and preventing illness. To ensure the best care for you and your family, Pierneef-Med also provides additional services e.g. Physiotherapist, Clinical Psychologist, Dietician as well as a Specialist Neurologist and Physician that works closely with us ensuring that your health is in good hands. Family comes first and at Pierneef-Med we strive to treat every patient that visits us as a family member. We invite you to come and meet our team of doctors and friendly staff where you will receive excellent health care and a warm welcome to get you back on your feet. Dr Stefanie vd Merwe is a General practitioner, with a special interest in gynaecology. She provides routine gynaecological examinations, sonars and pap smears as well as the diagnosis and treatment of menopausal patients. As mother of 4 children she has a passion in proving other mothers-to be with guidance and compassion in confirmation of pregnancy and pre-natal care up to 12 weeks. 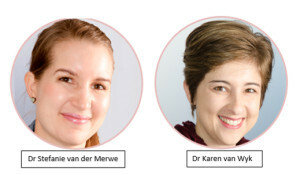 As General Practitioner, Dr Karen van Wyk enjoys the variety and personal interactions of general practice. She particularly likes small procedures such as wart and mole removals, as well as suturing and wound care. Dr Chris-Marie Prinsloo is a general practitioner who believes that primary healthcare is the most important part of patient health and wellness. She has a special interest in emergency medicine but enjoys the variety and personal relationships that forms part of family medicine.